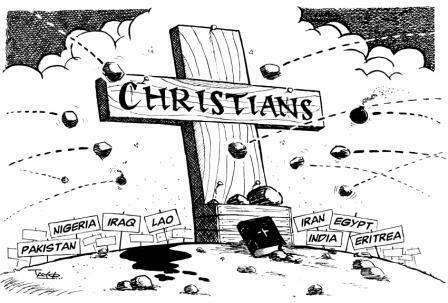 Christian persecution is on the rise. From outright slaughter of Christians in the Islamic world, to suppression of Christianity in China and now perhaps Russia, to marginalization of biblical Christian beliefs. Check out the article below which reports on the controversy that a United States church youth choir drummed up, (excuse the pun), simply for being part of a church that still believes in biblical doctrine. The haters wanted the choir to be banned from Scotland simply for holding firm on the definition of biblical marriage and the sanctity of life, including the unborn. We always knew that this was coming. For years, the horrifying persecution of Christians in the Middle East has made headlines all over the globe, but now we are seeing very disturbing examples of government-sanctioned persecution literally all over the planet. As you will read about below, Russia just banned virtually all types of evangelism outside of a church or religious site. And China has been tearing down thousands of crosses and has been demolishing dozens of churches in a renewed crackdown on the growth of Christianity in that nation. Overall, there are 53 countries that now have laws that restrict the Christian faith according to one recent report. When are we going to wake up and realize what is happening? Russian President Vladimir Putin signed into law last week a measure punishing any kind of religious evangelization outside of churches, which some observers have called one of the most restrictive move in "post-Soviet history." "This new situation resembles the Soviet Union in 1929. At that time confession of faith was permitted only in church," Hannu Haukka, president of Great Commission Media Ministries, told National Religious Broadcasters, according to Breitbart News. "Practically speaking, we are back in the same situation. These anti-terrorist laws are some of the most restrictive laws in post-Soviet history." The law, which is supposed to be aimed against the spread of terrorism and extremism, has also been approved by the Russian Parliament's upper chamber. The move blocks the sharing of faith in any place that is not a government-sanctioned house of worship. A youth choir booked to perform at major shopping centre in Edinburgh are part of a Texas “megachurch” that has been accused of being anti-gay and anti-abortionist.